Graet while on the go! 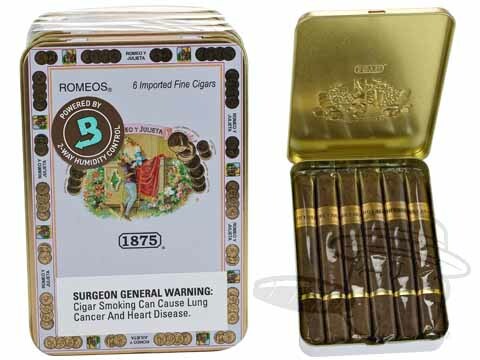 I have been buying Romeos from Best Cigar Prices for over 3 years and have been very satisfied with all areas of the ordering, product and customer service! This is a medium well balanced smoke from start to finish. A great smoke to start your day or a great one if not with your regular crowd. These cigars are usually very well constructed and draw very easily. I originally bought these for my wife, as she enjoys a good smoke on occasion. I tried one after a late night business meeting and found they really do have a great taste and aroma for such a small smoke. Great when you don't have time for your regular size smoke. The price is an extreme value. A tin of these babies in the local tobacco shops goes for around $18. You can get 5 tins for $35 or $7/tin at bestcigarprices.com Absolutely outstanding. Not as flavorable as the Monte Pronto, but good a value . We really enjoyed these at my daughter's wedding! Great little cigar with consistent construction for when you don't have time for a full sizer. Romeo Y Julieta 1875 Romeos is rated 4.5 out of 5 based on 14 customer ratings.